← Happy Birthday to Two Gennett Walk of Fame Inductees, Lawrence Welk and Miff Mole! March 12th in Gennett History, 1923: The New Orleans Rhythm Kings recorded “Shim-me-sha-wabble” in Richmond. It appeared on Gennett 5106, as well as reissue labels British Rhythm 1004, Jazz Classic 503 and L-27, and Vinylite Jazz Reissues 24. This recording featured Paul Mares (c), George Brunies (tb), Leon Rappolo (cl), Mel Stitzel (p), and Ben Pollack (bjo). 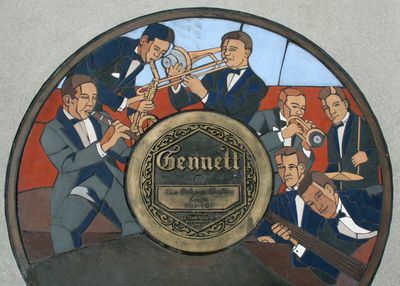 Video | This entry was posted in Gennett, Gennett Walk of Fame, March, Video and tagged Ben Pollack, British Rhythm 1004, Gennett, Gennett 5106, Gennett Discography, Gennett Records, George Brunies, Jazz Classic 503 and L-27, Leon Rappolo, March, Mel Stitzel, New Orleans Rhythm Kings, Paul Mares, Vinylite Jazz Reissues 24. Bookmark the permalink.